KIEV, Ukraine -- Co-hosting the 2012 European Championship is important for Ukraine's political integration, the former Soviet republic's soccer leader said Friday. Hrihoriy Surkis said it would have been "a disaster" for Ukraine's relations in Europe if it had lost co-hosting rights with Poland because of delays building stadiums and crucial infrastructure projects. "This would be a refusal of European integration," said Surkis, a former member of Ukraine's parliament. "We would have lost the trust and confidence and the image of the country would be very low." Instead, Ukraine will receive global attention Friday when 150 countries broadcast the 16-nation Euro 2012 draw, being staged in the Soviet-era Palace of Arts in Kiev. Ukraine had numerous minor problems to solve before the June 8 opening match, Surkis said through a translator at the Olympic Stadium, which will stage the final on July 1. Rebuilding the 70,000-capacity venue was UEFA's main condition for allowing Ukraine to retain hosting rights, and the project overran by at least $100 million, the soccer federation president said. Surkis said Ukrainians — who speak their native language or Russian, which use the Cyrillic alphabet — must learn to "charm" visitors, and be more like other Europeans. "This is our problem. We don't speak, like people do in Europe, all kinds of languages," he said. Ukraine is giving language training to service workers at restaurants, border crossing airports and police to prepare for the expected influx of visitors during the three-week tournament. 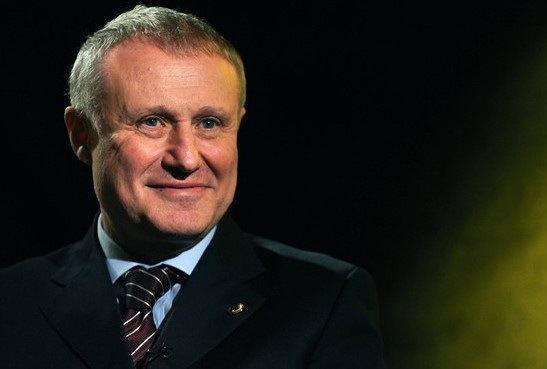 Surkis said Ukraine's modernization was part of a "five-year renaissance," after UEFA awarded it and neighbor Poland co-hosting rights in April 2007. The 62-year-old official likened the project to a Soviet-style, five-year plan to build facilities such as hydro-electric power plants. "Under the Communist Party leadership those things were built," Surkis said. Amid widespread doubts about Ukraine's ability to deliver upgrades costing billions of dollars during a global financial crisis, one presidential meeting was singled out as vital to the project's progress. UEFA President Michel Platini met Ukraine's newly elected leader Viktor Yanukovych in Kiev in April 2010 seeking guarantees for his showpiece football tournament. "Platini left his office and told me sincerely, 'Well, I trust this man, he is very confident,'" Surkis said. Yanukovych said Friday that Euro 2012 preparations were "catastrophic" when the UEFA head visited. "During four hours he (Platini) tried to convince me that there wasn't even the tiniest chance to build everything in less than two years," Yanukovych told Israeli daily Haaretz in an interview published on his official website. "During the final hour I tried to convince him of the opposite." Still, Ukraine has not won universal acclaim. Politicians in Europe and the United States have criticized a seven-year jail sentence given to Yulia Tymoshenko, the defeated rival in Yanukovych's election victory. She denies charges relating to her handling of a gas import contract with Russia. Asked if the issue could cast a shadow on Euro 2012, Surkis said he left politics to be "distant from the controversy that might take place between particular political forces." "In essence it is important because for the first time in the history of our country (that) the prime minister is sentenced," Surkis said. "I hope that ... Mrs. Tymoshenko herself has an opportunity to prove herself innocent."